Of course, there are nuances, details, and variable elements to each - are we talking about a "haunting" or a "possession"? (Think "Amityville".) But despite the seeming variety of each film, the ending will always be the same. But the ending, the big reveal, isn't really the point. It's how you get there. The key element of any scary story is the tension. The suspense. The feelings of imminent horror that builds throughout the film. Without that, you've got nothing. And no one cares. Unfortunately, the art of weaving a terror tale has somehow dissipated over the years giving way to cheap, jump-scares induced by predictably timed loud noises and flashes of CGI creatures. This is why I had irrationally high hopes for "Woman in Black". Originally written as a novel in the early 80's and brought to the screen by the horror powerhouse of Hammer Studios, the "scare possibilities" were so very high. 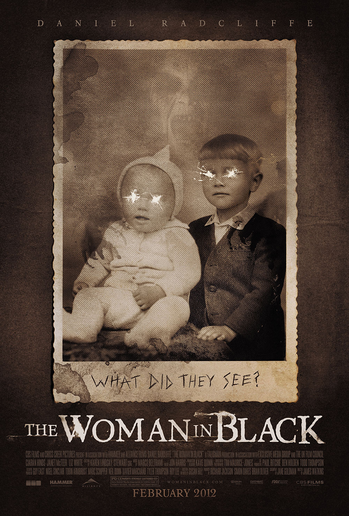 Woman in Black should have been a traditional, British, gothic tale of terror. Something that would get under my skin and leave me turning lights on in every room of my apartment for weeks afterwards. A slow-building, nerve-wracking descent into psychosis and fear. My primary complaint - and I'm sure many of you "Harry Potter" fans will hate me for this - was Daniel Radcliffe. I swear, that kid has no acting range whatsoever. He is flat, emotionless, and terribly unbelievable. In the face of strange noises, creepy townsfolk, horrible disasters, and even killer ghosts - he remains, mostly, unruffled. But not in a suave, James Bond kind of way. Its more like he's just not smart enough to understand what's going on. And he doesn't pursue the mystery with any sense of intent; he's sort of apathetic. He just drifts through the movie like a ghost himself. Who is the Woman in Black? Why are children dying? And does he even care? I couldn't tell. And really, if the protagonist doesn't care about his own story, why the hell should the audience? His performance is put to shame by Nicole Kidman's in "The Others". She appears to be on the edge of panic for nearly every second of the film. In the face of unexplainable terror she is, convincingly, terrified. And angry. And confused. I never once asked myself, "Is this woman passionate about solving the mystery here?" Because she clearly is. My next complaint is in the pacing. There's no tension. No slow burn. No reason to keep watching. The movie was like a math problem: A + B = C. The end. Boring. Structured. Predictable. Bland. Emotionless. And then there are the effects. The jump-scares. The over-explaining. Where's the subtlety? Scare me, damnit! Don't show me everything. Stop telling me that the movie is scary and scare the crap out of me, already! Let my imagination do it's job and invent reasons for my heart to race. Okay - wrap up time. Oh - and if you're wondering which ending this movie has, you'll just have to waste your own time watching it.